Harper Voyager Books: Advance Readers Wanted! 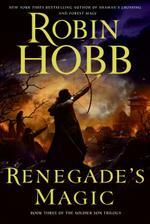 We're looking for 10 advance readers for Robin Hobb's newest book, RENEGADE'S MAGIC on sale January 8th, 2008! From master fantasist, Robin Hobb, comes the thrilling conclusion to her Soldier Son Trilogy--an extraordinary adventure of love and intrigue, privilege and magic. Nevare Burvelle is an innocent man framed and convicted of unspeakable crimes. Despondent and with nowhere to turn, he reluctantly surrenders hismelf to the Speck magic with which he has been cursed. But the decision is not without consequence, for now Nevare is at the mercy of his Speck self: a powerful alter ego who will stop at nothing to drive the enemy Gernians away from Speck territories--and use his warrior’s insight to plan a vicious and horrifying attack on those who would do him harm. But events unravel in unexpected ways, and now Nevare must bring his warring selves together to find lasting peace for himself and both his peoples. If you're interested, send an email to eosbooks@harpercollins.com with your name and address.